Our range of products include siron 878ad 2 in 1 digital smd rework station, digital smd rework station, smd rework station, smd rework station with auto cut and smd rework stations. 1. Comfortable portable handheld and the Digital LED display. 3. Adjust the air flow and temperature control rotation. 4. Refer to the instructions included with three kinds of stainless steel nozzles (big,medium and small) replacement part for Versatile Applications . 8. This product is ESD-protected. 11. Safe solder QFP, PLCC, BGA and other temperature-sensitive components.Also for Heating Shrink, Viscidity Removal, Lacquer Removal, Preheating, Glue Soldering and Ice-Out. 13. Green lines and high-quality silicone body heat good for extend life and save power. 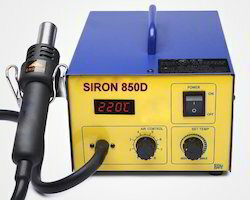 SIRON 850D Digital SMD Rework Station: Ideal DIGITAL SMD BGA hot air rework station. The ideal equipment for use in the laboratory and every workshop.It is a high-tech hot air SMD Rework Station, comes with most advanced and long life Temp. Controlled heating element and best quality copper winding air Diaphragm pump with a max. 24L/min air.It is very easy to handle and operate. The black coated housing is equipped with a practical carrying handle. Even a layman can use the station in a few minutes.Comes with three different nozzles, a lifting device for components (IC-Popper with a spare gripper), so that you can work without additional costs! Perfectly suitable for repairing BGA, connecting plastic, mobile phone speakers and other electronic components, for example QFP, SOP, PLCC and SOJ components. High temperature and airflow adjustment range. Extremely short air heating up time. The air cools down the heating element continuously after use and therefore increases the lifetime of the heating element. We are leading manufacturer of SMD Rework Station. Keeping in mind changing requirements of the clients, we are offering a quality range of SMD Rework Station.These products are highly demanded for its durability.The product we offer is widely demanded for its sturdiness and quality. 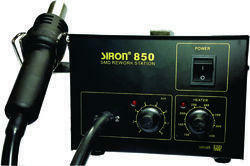 The SMD Rework Station we offer is recommended amongst the clients for its safe use. Moreover, these products are easy to install and known for rending hassle free performance. 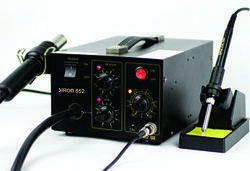 We are presenting a quality range of SMD Rework Station with Auto Cut. 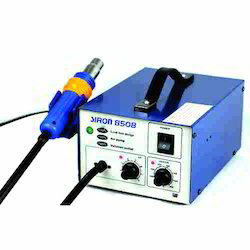 The SMD Rework Station with Auto Cut we offer is widely demanded for its durability and reliability. Offered products are known for their reliability. Safe solder QFP, PLCC, BGA and other temperature-sensitive components. Adjust the air flow and temperature control rotation. Refer to the instructions included with three kinds of nozzles (big,medium and small) replacement part. Would replace the part if the resistance value is incorrect. When the temperature is less than 70oC, can stop rotation automatically. Intelligent detection and cool airflow features. Green lines and high-quality silicone body heat good for extend life and save power. Keeping in mind changing requirements of the clients, we are offering a quality range of SMD Rework Station. 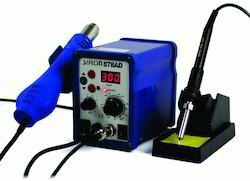 The SMD Rework Station we offer is recommended amongst the clients for its safe use. These products are highly demanded for its durability.